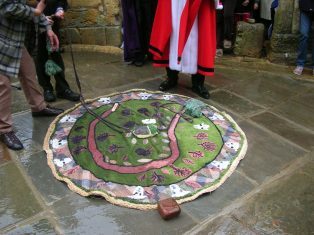 The uncovering of the new Cotswold Way marker stone near the Market Hall, Chipping Campden was a real festive event, in spite of the heavy rain. A group of walkers met at Dover’s Hill and, led by Cotswold Wardens Jean Booth and Simon Mallatratt, walked the last leg of the 102 mile Cotswold Way down to Campden. They were greeted at the Market Hall by the Mayor and Council members in full regalia, the steering team and helpers, with invited donors, residents and visitors, including Carol Jackson, Vice-President of CCHS and also a Cotswold Wardens Town Guide, who represented CCHS on the Steering Committee. 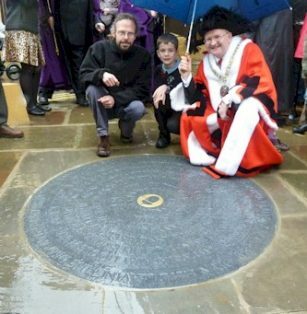 After speeches the marker stone was unveiled by the Mayor and St James’ School pupil, Ben Lishman, who walked some of the Cotswold Way and helped to raise money with his school. Now walkers and visitors have a beautiful disc of limestone, with a brass acorn central motif (the symbol for all National Trails) with a smaller symbol beside Chipping Campden, surrounded by a quotation from T.S. Eliot and place names from along the Cotswold Way, which invites readers to walk, provides a welcome for tired feet and food for thought for visitors to Campden. It is mirrored by a similar marker at Bath Abbey and together they act as bookends for the Cotswold Way, marking the beginning and the end of the walking route. The quotation is from the second poem of T.S. Eliot’s Four Quartets: “Now the light falls across the open field, leaving the deep lane shuttered with branches, dark in the afternoon”. T.S. Eliot visited in Campden several times in the 1930s and was inspired to write the first poem Burnt Norton, through his walking experience here.